Harry Plunket Greene was born on 24th June, 1865, son of an Irish barrister and a story-writer mother. His schooling was foreshortened by a rugby accident and instead of going to Oxford he went to the Continent to study singing. Early in his career Greene appeared in opera (including Romeo et Juliette at Covent Garden), but he then teamed up with Leonard Borwick the pianist and together they toured the world performing vocal and pianoforte recitals. Harry Plunket Greene’s remarkable powers of interpretion and gifts of phrasing revolutionised the musical world of the time, causing a new type of song to be composed and sung - a song described by Sir Percy Buck at Greene’s memorial service as one ‘that could bear the fresh air and bright light which seemed to be the elements of which his own nature was compounded’. 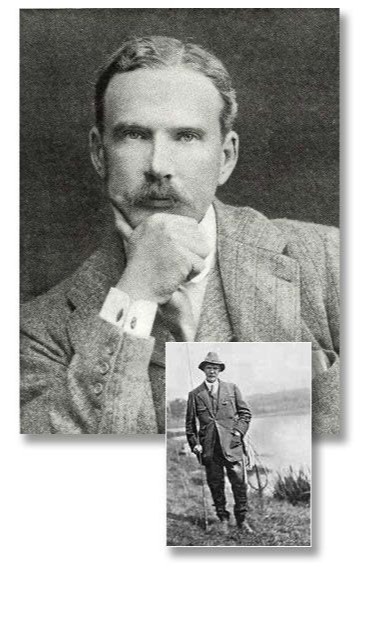 In 1899 he married Gwendolen Maud Parry, daughter of the composer Sir Hubert Parry, and in 1902 they bought a house in Hurstbourne Priors so that he could be close to its trout-filled chalkstream, the Bourne. The next ten years were, it seemed, some of the happiest of his life, and his love of the Bourne was to last a lifetime. In 1911 he became Professor of Singing at the Royal Academy of Music and a year later at the Royal College of Music. The family moved to Hungerford in 1913 but Greene was to return frequently to visit his beloved Hurstbourne Priors and its river. Music was the main preoccupation of his life, and he became a bass-baritone singer of international standing. He was also a brilliant writer, his books including Interpretation in Song, a biography of his friend, the composer Sir Charles Villiers Stanford, Pilot and other Stories, From the Blue Danube to the Shannon, and his only fishing book Where the Bright Waters Meet. Plunket Greene was a passionate fisherman and just as his singing brought a freshness to the musical scene of the pre-war years, so does his writing in Bright Waters bring vividly to life the sparkling Bourne river, and his immense enjoyment of it. He was a man who had a great zest for life, but he was also a man who, because he loved the countryside so much, also cared deeply about what happened to it. Harry Plunket Greene died at the age of seventy-one on 28th August, 1936. Where the Bright Waters Meet is a great angling classic, one that not only conveys the joys and pleasures of fishing a small chalkstream, with the friends that are met along the way, but one that also reminds us of the greatness of Nature, and our culpability in its destruction.